When you read the baby books, one of the things you read over and over is to set up a “bedtime routine” for your baby. The good old four B’s: Bath, Bottle (or Breast), Book, Bed. Having a solid bedtime routine can help “cue” your infant and toddler that it is time for bed. But not only that, your bedtime routine can be an excellent time to work on building your child’s language skills! You can do this by making sure to include two aspects to your infant, toddler, and preschooler’s bedtime routine: reading and singing. READ, READ, READ! The number one recommendation I give parents when they ask me what they can do to help their child with their speech and language skills is to READ. But unless you have it built into your day, sometimes you can simply forget to do it some days. Which is why I recommend to make it a part of the bedtime routine (and also as part of the nap routine.) This way, you will be able to make sure read every day. How long should I read for? I typically recommend reading for 10-20 minutes a night…it really depends on your child. My daughter E, who is almost three (oh my- three next month! ), would probably let us read for hours at night if we offered 😉 We usually read for 10-15 minutes, some nights longer. We also read at nap time. And just a fun family tid-bit: My daughter’s love of books is so great that instead of sleeping with stuffed animals or a blankie, she sleeps with books! In fact, the theme for her second birthday party was “Bookworm”! 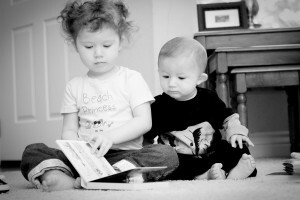 Now, at almost three, she “reads” to her baby brother. SING SING SING! You don’t have to have a great voice to sing to your baby or child! Singing not only provides you with opportunities to bond and interact with your child, but there is also evidence to suggest that singing to your baby supports later language development. A study presented by Dr Ruth Hewston from the University of Warwick in the UK in 2007 found evidence that babies that were sung to regularly were picking up early language skills faster than the control group. You can read an article about this at ABC News, Australia HERE. What should I sing to my child? Honestly, ANYTHING! You can sing traditional children’s songs, or you can belt out your favorite Beatles tune, or the most recent Lady Gaga single. I personally sing more traditional songs myself and then expose them to all genres of music at home, in the car, etc. (My daughter E prefers hip hop music! She loves anything with a beat and loves to dance. We listen to a lot of the Black Eyed Peas around here 😉 ) Some of the songs we sing around here on a daily basis include Twinkle Twinkle Little Star, The ABC’s, The Wheels on the Bus, Where is Thumbkin, The Itsy Bitsy Spider, Old Mac Donald, B-I-N-G-O, Days of the Week, Colors of the Rainbow Song, I’m a Little Teapot, etc. The month of December is dedicated to Christmas Carols! A GREAT site for children’s songs lyrics and info is http://bussongs.com/. So get reading and singing! Check back for more ideas of books to read and songs to sing! And let me know, what are your child’s favorite books and songs? Emma loves Dr. Seuss books, Curious George books, and anything with animals in it. She also loves music. The Itsy-Bitsy Spider is a favorite of hers at the moment. We sing a lot of those traditional songs, plus a lot of children’s songs from church. As an elementary school teacher, I have to add that reading to your child not only improves their language skills, it teaches them reading skills! Yay for reading and singing! Exactly Sarah! Reading to our babies and toddlers is also providing them with the foundational skills for reading in addition to improving their language skills. Reading just rocks! Itsy Bitsy Spider is one of E’s favorites too!